It’s never fun to call it quits on camping season. Some of us even experience what we call “the winterization blues,” a mild to severe case of gloominess that can linger until the rig gets reopened in the spring. But for many of us, whether we like it or not, camping season does come to an end, and winterization is a sad reality. Our best bet is to take some precautions and do it right. Here are six quick tips to show your RV some winter love and make sure she is ready to hit the road come spring. Get all food and liquid items out of the RV! This includes hand soaps, toothpaste, shaving cream, and the like. These bathroom items can freeze and crack in the winter, leaving a sloppy mess in the spring when they melt. We ruined the medicine cabinet one winter by leaving a tube of shaving cream in a dark corner of the bathroom. Never again! Our three boys are gifted at getting crumbs into every imaginable nook and cranny of our rig. When it’s time to shut down the shop, make your RV as critter proof as possible. That means getting down on your hands and knees and working that vacuum until your back hurts. Follow up with a wet mop for good measure. Your RV refrigerator can get all kinds of nasty during the winter months, but not if you scrub it until it shines. Leftover food residue will get moldy and make your fridge look a middle school science experiment. Propping open the fridge and freezer doors is also a must if you don’t want a nasty surprise come spring. Water is your RV’s worst enemy during winter storage, so make sure to get it all out of your tanks and fill them with antifreeze. If you are not confident with this relatively easy process then we suggest having your RV winterized by a local dealer or mobile RV repair service. This will only cost about a hundred bucks. If you prefer to do it yourself, make sure you follow the instructions of your dealer or manufacturer, since each RV has different requirements. 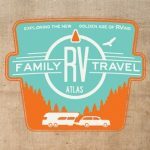 We never covered our RV tires until a maintenance guru came onto our podcast and explained the importance of this simple and inexpensive precaution. RV tires can look healthy to the eye and have excellent tread, but extensive exposure to the sun can degrade the rubber and cause weather cracking. When we bought our second RV the salesmen recommend not using a cover for the RV during the winter. He suggested that water might pool up inside the cover and cause damage. I didn’t really want to spend the extra money so I listened to his advice and cheaped out. I regret that decision. The front cap of our RV has faded badly and looks much older than it actually is. As for water pooling up inside the cover, that problem is easily avoided by sporadically shaking out the cover over the course of the winter. Now that you have your beloved memory-making machine to bed for the winter, it is critical to keep the winterization blues at arm’s length. We have a tip for that as well…start planning your next great RV adventure! Save What is good mileage for a used car?